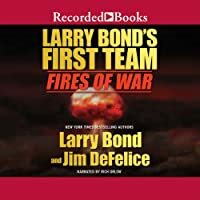 Larry Bond, New York Times bestselling author of Dangerous Ground, and Jim DeFelice have earned widespread acclaim for the gritty authenticity and spellbinding suspense of their military-political adventures involving the First Team. "The Team" lead by top CIA officer Bob Ferguson, and supported by Special Forces commando Stephen Rankin and Marine Jack Young, is authorized to take immediate action, beyond the bureaucratic restraints of US intelligence or the military establishment, in the ever-surprising War on Terror. After years of exhaustive negotiations, North Korea's Kim Jong Il abruptly agrees to surrender all of his nuclear weapons. This sudden change in policy has the US suspicious, and the Team is dispatched to uncover the truth. Newest Team operative, the young and beautiful Thera Majed, goes undercover during the preliminary inspections of the entire Korean peninsula, on a mission so sensitive that she will be disavowed if discovered. But when she discovers hidden weapons in South Korea, a firestorm of debate is set off in Washington. A public announcement of their suspicions regarding could derail the North Korean agreement, and the South Korean government may not even be aware of the weapons' existence. Ferg and the rest of the Team jump in to investigate, and the closer they get to the truth, the harder mysterious forces work to keep them away. Someone is planning for a full-scale nuclear attack that would throw the civilized world into political and economic upheaval, and Ferg and the Team are the only ones in the position to stop them.